Very large, gruff, sarcastic comic shop/magazine vendor who sells Bart and pals old comic books (Radioactive Man, Itchy & Scratchy, etc.) at exorbitant prices. Says: "That'll be $750, kid!" 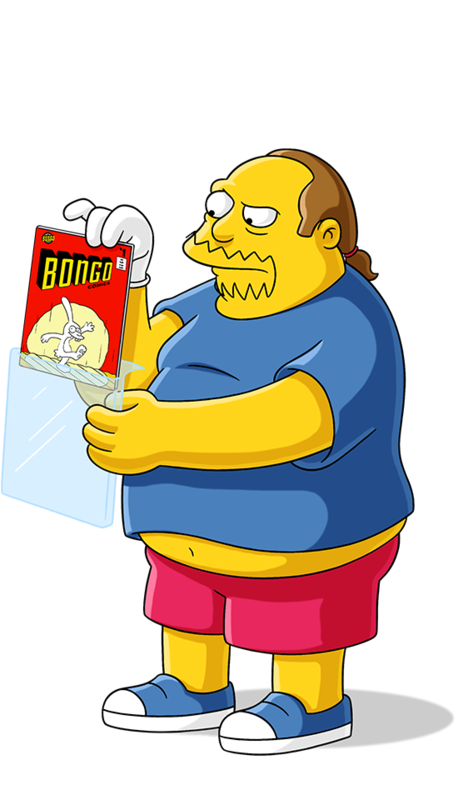 Bart and Comic Book Guy barter for Krusty memorabilia. Homer tries to sneak Bart and Milhouse into the Comic Book Shop to see Tom Savini. Skinner is not pleased when his mother goes on a date with Comic Book Guy. Pie Man confronts Comic Book Guy about coercing Bart. Bart asks Comic Book Guy for his origin story. Try to explode this out of my belly.